Madeleine L’Engle’s A Wrinkle in Time is one of my all-time favorite books. I loved it when I was 11, read it aloud to our children, and went on to read all of the sequels and most of her other books as well. So it was with a lot of anticipation, excitement, and not a little trepidation that I looked forward to the film. On the one had, the book had been dismissed over the decades as unfilmable due to its planet-hopping storyline, fantastical characters, and genre-straddling themes. On the other hand, I have the utmost respect for director Ava DuVernay (“Selma,” “13th”) and co-screenwriter Jennifer Lee (“Frozen,” “Zootopia”) and the all-star cast looked promising. I held my breath, crossed my fingers, and leaned forward and caught my breath as the iconic Disneyland castle in the opening logo suddenly…wrinkled. Most of what I love about the book was beautifully realized, and the movie is sure to be a middle school sleepover perennial and a family favorite for generations. It’s made straight from the heart of people who remember what it feels like to be 12 — and the way we all become 12 again in moments of uncertainty. If there’s a bit more Oprah-esque “you go girl” and “living your best life” than in the book, well, the movie features not just Oprah (who was also in “Selma”) but a house-sized Oprah with lips and eyebrows that look like someone went overboard on the Bedazzler. 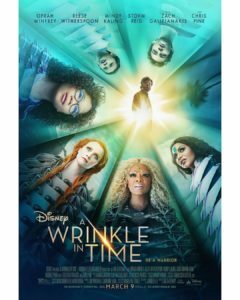 Meg Murry (Storm Reid) is the daughter of two scientists (Gugu Mbatha-Raw and Chris Pine). She was once a gifted and attentive student, but since the disappearance of her father, four years before the movie begins, she has been sullen and uncooperative. Mean girls pick on her, and when she responds by throwing a ball at the ringleader, she gets in trouble. Nothing makes sense to her, and she wonders if her father left because she was not good enough. Meg has an exceptionally precocious six-year-old brother named Charles Wallace (Deric McCabe). In the book, he is her bio-brother and they have two older brothers as well but in the movie it is just the two of them and Charles Wallace was adopted just before their father disappeared. Charles Wallace is one of the major challenges of adapting the book, because on the page he is endearingly hyper-aware and ultra hyper-articulate, but on screen it is difficult to make him believable and keep him from being annoying. It is one of the film’s most salient weaknesses that this critical character does not work. The book’s most memorable message comes when Meg is told that what will help her to rescue her father is her faults. Though how those faults help is not as explicitly explained in the film, that idea retains its power here. That makes up for some faltering in the climax, some under-imagined images, and some distractions that seem to stem from a lack of trust in the audience. We don’t really need that extra back story on the mean girl or Calvin (an odd change from his home life in the books, which will be a problem if they decide to film the sequels) to understand what their insecurities are or the time spent cheering Meg on (and apologizing to her and deferring to her) without making it clear what her strengths are and how they are connected to her faults. It would be better to focus on the book’s rare combination of both faith and science and how important both are. In the book, the children visit the planets to learn about the darkness and to see that it can be overcome (Mrs Whatsit is the result of one such triumph). The movie leans more toward an Oprah-eque message of empowerment, so the focus is more on individual self-realization (and being appreciated by others, including Calvin, which seems to be his primary purpose in the story). The three Mrses are not quite as fun as the movie thinks, though Mrs Who’s Bumblebee-like “post-language” use of quotations (always noting the nationality of the author, from Rumi and Shakespeare to Lin-Manuel Miranda and OutKast) is charming. But Reid is a heroine to root for, and the Murry family is one we are, like Calvin, glad to have a chance to visit. 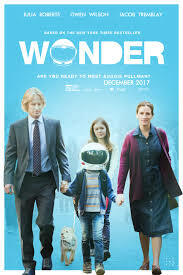 Parents should know that this film includes extended sci-fi/fantasy peril with some violence and scary images, issues of an absent father, a school bully, and an abusive parent. Family discussion: What are your most valuable faults? Why was Meg so important to IT? Those of us who remember the 1995 release of Pixar’s first feature film, “Toy Story,” feel that we’ve all grown up together. It isn’t just the astonishing progress in the technology (the reason the first film’s characters were toys was that all they could animate were shiny smooth surfaces). 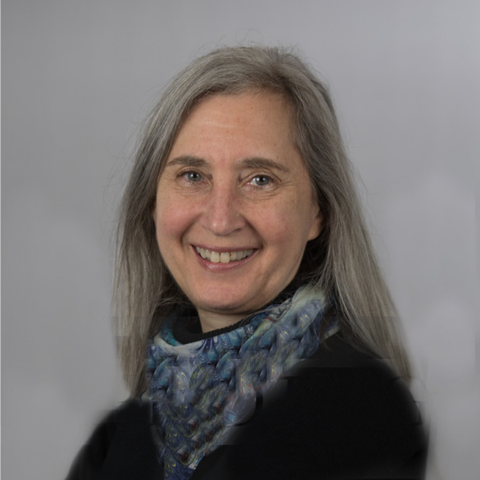 It is the progression of the themes of the films, the first one literally about a child’s playthings, through stories that deal with increasingly adult concerns about aging, loss, and meaning. 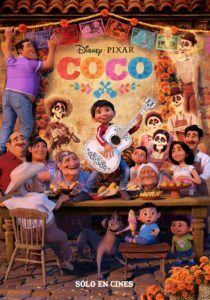 “Coco” is the story of a Mexican 12-year-old named Miguel, but the title reminds us that the central character is his great-grandmother Coco, struggling with dementia but beloved by her family. It has the dazzling visuals, expert tone and pacing, and the smiling-through-tears moments we have come to rely on from Pixar. Miguel (Anthony Gonzalez) is the youngest in a big, close family that lives together and works together in the family shoemaking business. He tells us the story of the family through beautifully animated papel picado, the lacy paper cutouts that are a Mexican tradition. His great-great grandfather abandoned his wife and daughter, the then toddler Coco, to pursue a musical career and since then the family has banned any member from playing or even listening to music. But Miguel loves music and has a secret room where he watches old clips of the community’s biggest music and movie star, Ernesto de la Cruz (Benjamin Bratt) and plays his homemade guitar, painted to look like de la Cruz’s. Miguel hopes to play in a talent show but his grandmother, Coco’s daughter, finds out and smashes his guitar. When Miguel tries to borrow de la Cruz’s guitar from his crypt, he is somehow transported to the Land of the Dead, just as the residents are making their annual pilgrimage over the marigold-strewn bridge to visit the families who have invited them with photographs and memories. There he recognizes his ancestors from the family ofrenda (shrine with photos, candles, food, and mementos). Like Dorothy in Oz and Alice in Wonderland, he has many adventures on a journey in an enchantingly imaginative world but wants to go home. If he does not return by sunrise, he will have to stay there forever. The Land of the Dead is gorgeously imagined, filled with thousands of lights and the kind of fascinating details that are made for the pause button. The — I’m going to call them people, but they look like skeletons with eyeballs — live in a stratified world, where those who have extended families and are best and most lovingly remembered have beautiful clothes and homes while those who are alone and nearly forgotten live in a (still-picturesque) slum and call each other “cousin” and “uncle” to pretend that they are still connected to someone. Once they are no longer remembered, they just dissolve into dust. Miguel meets Hector (Gael Garcia Bernal), a loose-limbed, poorly dressed skeleton who is close to dissolving as he is being forgotten in the land of the living. Hector agrees to take Miguel to Ernesto de la Cruz, for help in going home, if Miguel will bring back Hector’s photo, so he can be remembered. It is good to see Mexican culture portrayed in such a straightforward manner, not exotica-sized or othered. There are some exciting adventures and some very funny moments along the way, involving Miguel’s sidekick, a Xolo street dog named Dante, a wild talent show/concert, a still-pushing-the-edge-of-the-artistic-envelope Frida Kahlo, and a psychedelic-colored flying lion-headed creature, one of the alebrije who guide the dead to where they are supposed to be. The skeletons are brilliantly animated, each with a very individual personality and a lot of fun with bones that, without tissue, do not always hold together. Moments of warm humor keep the story from getting maudlin, and moments of true-heartedness make us feel as connected to the Land of the Dead as Miguel is. 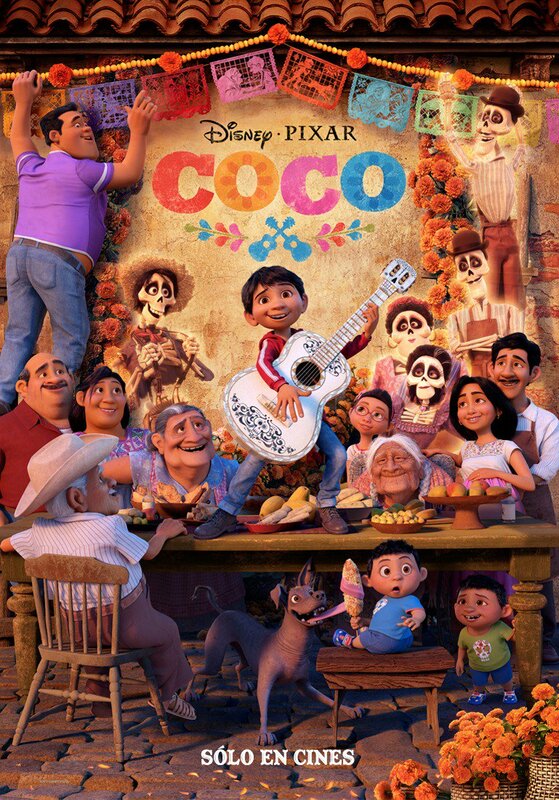 Parents should know that much of the film takes place in the Land of the Dead (heaven) filled with skeletons, and it has themes of loss including memory loss, and murder and alcohol. Family discussion: When is the right time to seize the moment? Ask your family for some stories of your ancestors. What stories do you want people to remember about you? “Leap!” would be amiable if a bit dull, a mediocre-grade filler if not for a crucial misjudgment about the main character’s choices and consequences and a storyline that depends on two key characters having completely unfounded total changes of personality. 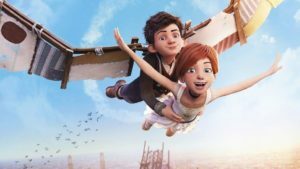 The premise is a generic “kid with a dream” story about a boy and girl who run away from an orphanage to pursue her dream of becoming a dancer and his dream of becoming an inventor (and his other dream of becoming her boyfriend) in Paris of the late 19th century, as both the Eiffel Tower is being built. The spirited Felice (Elle Fanning) and awkward Victor (Nat Wolff) are best friends who are the closest thing to family in the orphanage run by stern Mother Superior (Kate McKinnon), and grumpy Luteau (Mel Brooks), a cross between a janitor and a truant officer. With the help of mechanical wings invented by Victor, they finally make it to Paris, where Victor becomes an apprentice to an engineer and Felice lies her way into the prestigious ballet school, using the acceptance letter of a snooty rich girl named Camille (real-life dancer and Sia muse Maddie Ziegler). She actually does not know anything about ballet, but a mysterious cleaning lady with a limp with the name of one of ballet’s most famous roles, Odette (singer Carly Rae Jepsen) agrees, Mr. Miyagi-style, to give her some lessons. Jump up to ring a bell tied to a tree branch and land in a puddle without making a splash. And yes, wax on and wax off — but with her feet. We know where this is going. Strong voice talent and some imaginative visuals, especially in the dance scenes, cannot make up for tedious detours (a handsome and charming young male dancer who makes Victor jealous, a dragon lady meanie a la Cruella de Vil, a visit to the in-progress Statue of Liberty with a recitation of the Emma Lazarus poem that we have all just been reminded was not added until later), and, as noted, plot developments that depend on two characters having complete changes of personality for no reason. Most troubling is that Felice makes repeated serious mistakes, breaking promises and telling lies, with almost no consequences, giving a sourness to the storyline. It’s one thing to imagine that a young girl could learn several years of ballet training in a few days; it’s another to show her hurting the people around her, and then have her easily forgiven without any effort to make amends. Parents should know that there is some reckless and irresponsible behavior with only minor consequences; they will want to discuss Felice’s choices and their impact on the people around her. There is also some potty humor. Family discussion: Why did Felice break her promise to Odette? How did helping Felice change Odette’s ideas about herself? I’ve got a pretty high tolerance for movies, even syrupy ones, about super-gifted kids and am generally willing to give them some leeway as metaphor or fairy tale. So I’m okay with “August Rush,” “Pay it Forward,” “A Monster Calls,” etc. But “The Book of Henry” crosses the line from syrupy to smarmy, and where it wanted to be endearing, it was annoying, and then infuriating. Jaeden Lieberher, who is making a career out of playing preternaturally wise and powerful children, has the title role as Henry, an 11-year old who is the kind of genius only found in movies. Not only is he a total braniac who understands architecture, finance, electronics, existential conundrums, weapons, and engineering, he has a rapier wit and knows the difference between different kinds of tumors and can read an MRI. Furthermore, he is a near-empath who instantly understands the people he cares about. In other words, he is not a character; he is a symbol and his purpose in the story is to give other characters important life lessons. Henry has a younger brother, Pete (Jacob Tremblay of “Room”), who is in the movie to play the role of Normal Kid. And they have a mother, Susan (Naomi Watts), who is loving and devoted but irresponsible. Henry is the grown-up in the family, stopping at a phone booth after school to place complicated brokerage orders. Let’s pause for a moment on that last point. Yes, I said phone booth. Even though the movie takes place sort of now (there are cell phones, a coffeemaker, video games, and a super-duper weapon), it has a deliberately retro feel. Henry and Pete use old walkie-talkies, barely a glimpse of a laptop (who needs one; Henry’s a walking Wikipedia). Susan is a waitress at a diner that could be out of the 1950’s, though her boss (“SNL’s” Bobby Moynihan) offers to pay her by direct deposit. You do not need to be Henry to figure out that this is supposed to lull us into cutesy-ness. 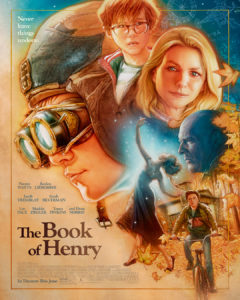 Henry has a crush on the girl next door, a classmate named Christina (Sia muse Maddie Ziegler), who lives with her stepfather, Glenn (Dean Norris), the town’s police commissioner. Henry senses that Glenn is abusing Christina. When Glenn’s position of power makes it impossible to protect her through official channels, he comes up with a dangerous plan to keep her safe. To say more would be to risk spoilers, so I will just note that pretty much everything that happens after that is intended to be touching and poignant but none of it is . Lee Pace does his best with the thankless role of Doctor Perfect, who would make Prince Charming look like the guy who gets eliminated in the first episode of “The Bachelorette.” And Sarah Silverman adds some sass as Susan’s best pal, who joins her in wisecracks about how they aren’t rich and in getting drunk. Christina has a lovely dance number in the school talent show. And Watts is marvelous as always. But the story’s preposterousness and manipulation thwarts their best efforts to provide some grounding. Parents should know that the movie’s themes include child sexual abuse, attempted vigilante murder, and a very sad death of a child, and suicide. There is some strong language, a drug reference, and drinking and drunkenness. Family discussion: What should Susan have done about the couple in the store? What made Susan change her mind?